Amazing to think that the M109 series of self-propelled 155 mm howitzers first entered service more than 50 years ago and they are still frontline weapons in US service! Despite this longevity, the M109 has been conspicuously ignored by manufacturers of injection moulded kits. Fortunately, resin manufacturers have come to the rescue, and, in the last few years, both OKB Grigorov and Black Dog have come out with kits. OKB Grigorov have covered the M109, M109A1 and M109A2 variants, while Black Dog issued the M109A2. 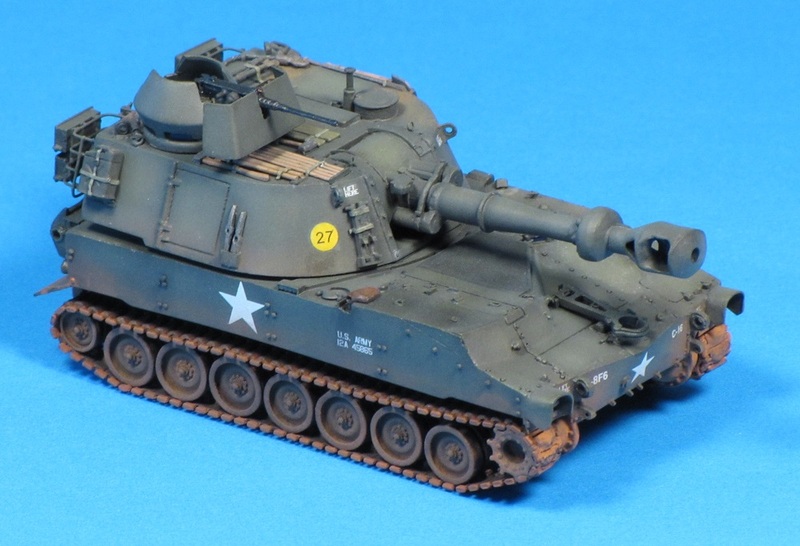 While the long barrelled guns of the later versions may be more impressive, I've been wanting to build a Vietnam-era M109 with the short M126 howitzer for years, and finally took the plunge and ordered the OKB kit. 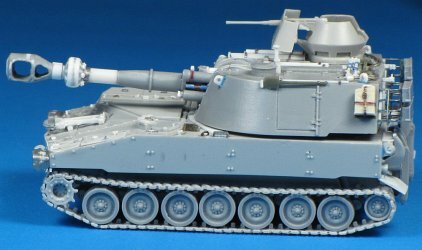 The M109 kit comes well-packed in a heavy-duty cardboard carton, with bubble wrap protecting the contents. 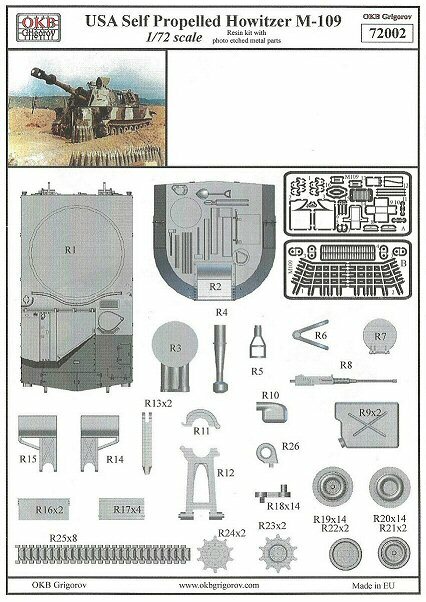 Again, instructions consist of one page of double sided A4 paper with CAD renderings of the parts in their assembled locations. 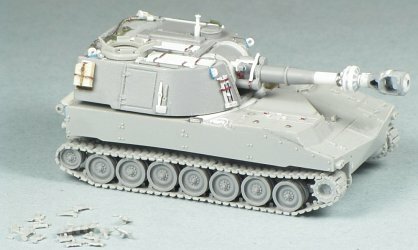 No decals or painting instructions are provided. 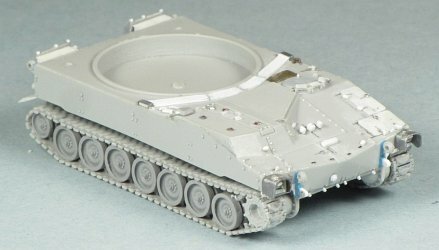 The kit contains 82 resin parts, 58 of which are for the wheels, suspension arms and tracks; and 2 small photo-etched frets. All parts appear to be created from 3D printed masters and a faint pattern of lines is apparent on the top surface of the turret. Cleaning these up will be tricky with the tools moulded into the turret roof. The hull shows no such marks, but the moulded-in handle and bolt detail is a little soft. I found only one air bubble in my kit, affecting one of the fuel cans. 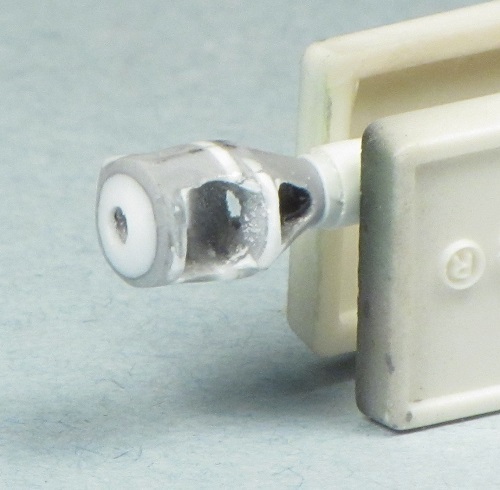 Two towing eyes on the front of the hull were broken off and missing from the kit, though these are easily replaced. The suspension and tracks are entirely provided in resin. 8 equal lengths of resin track are included, so it's up to the builder to somehow bend these around the idler and sprocket, as well as obtain the sag along the top run. 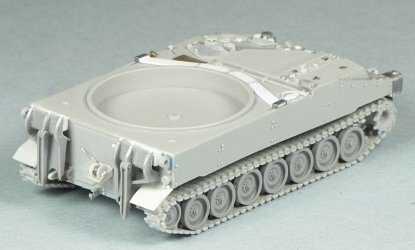 To help, OKB Grigorov provide 1/72 scale line drawings of the suspension, which can be used to create templates to be used to heat and form the tracks to shape before installation. On the plus side, the detail on the tracks looks great! The real M109 used 158 track links (79 per side), and the kit provides 224. Individual suspension arms are provided and they are keyed to fit into the hull at the correct angle. 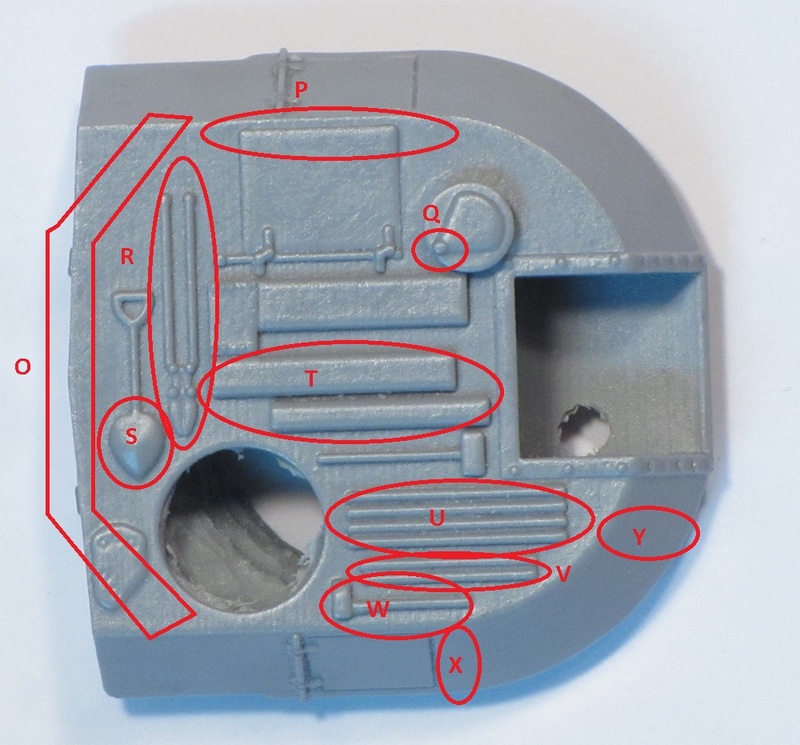 Unfortunately, the triangular holes in the hull are too small to accept the pins on the arms. 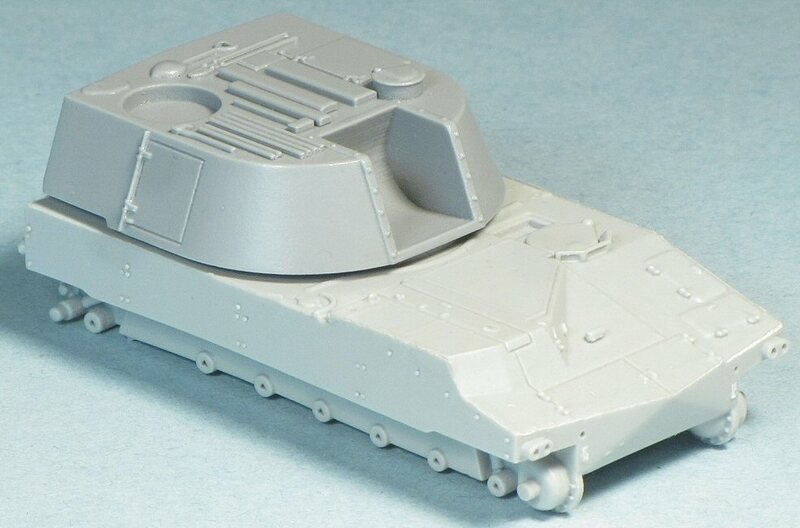 The turret and hull are cast with all hatches moulded in place, aside from the commander's cupola. This is provided as a separate part, but still with the hatch moulded shut. 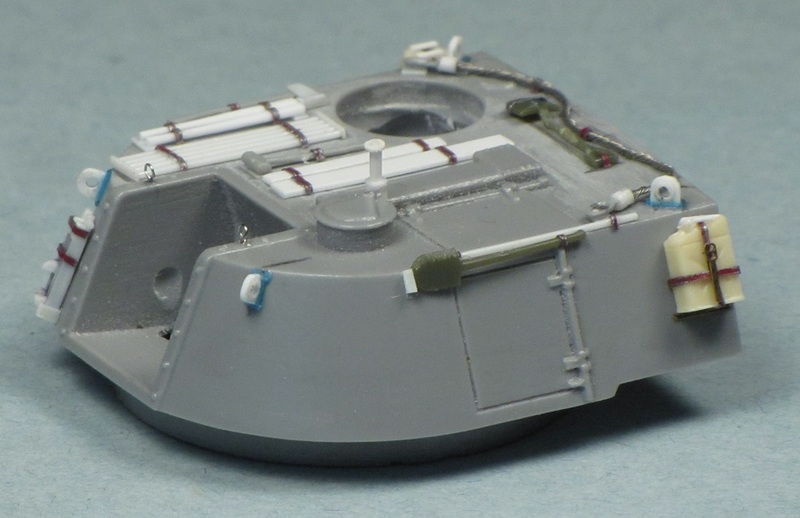 As mentioned, tools are moulded on the turret roof. The tools are moulded with good relief, but the shovel blade is wrong, the large pair of bolt cutters should actually be a stowed tripod for the 50-cal, the axe is poorly shaped and none of the tools have any mounting straps or brackets. The tools stowed on the sides of the turret (mattock heads, track mounting tool and long-handles shovel) are all missing, as is the tow cable stowed on the turret roof. An M2 50-calibre machine gun is provided for the commander's cupola. 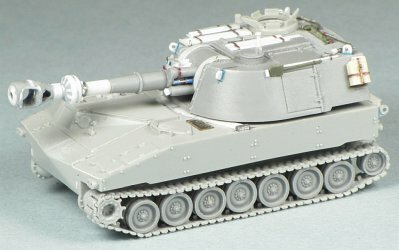 The gun is nicely detailed, however the barrel is warped. Photo-etched parts are provided for the spade grips and ammo box and mounting tray. The armoured cover for the sight is moulded closed, and the vertical shaft on which it extends is missing. 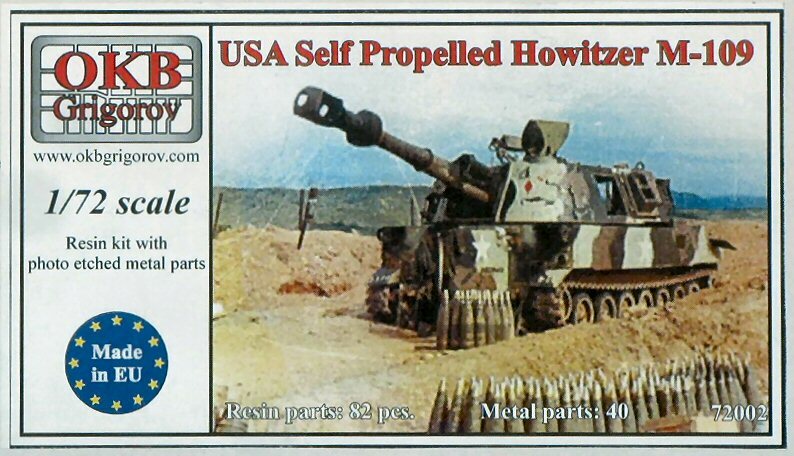 The 155 mm howitzer is moulded as a separate barrel and muzzle brake. 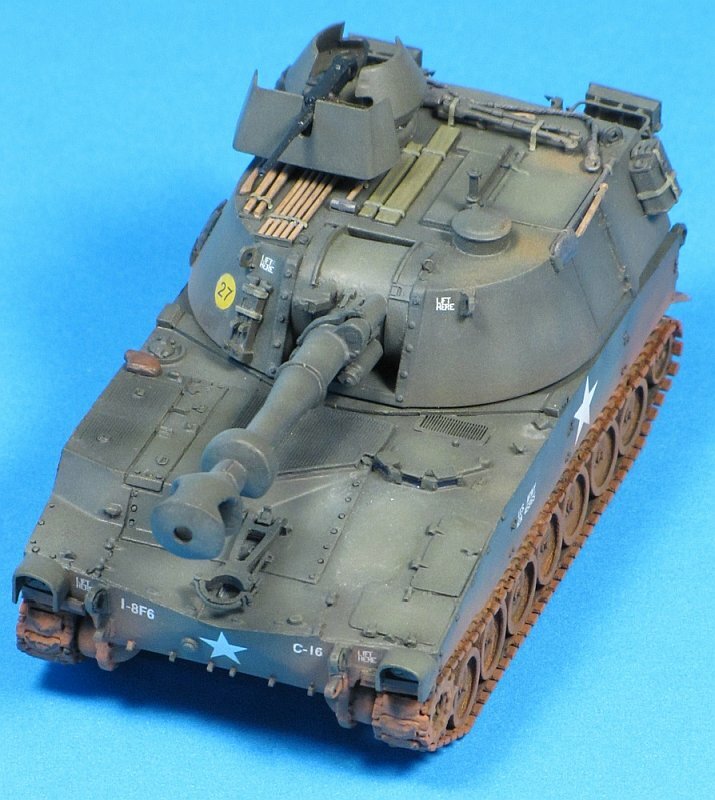 The massive muzzle brake has some issues - it has a completely flat front face, whereas the actual part is convex and it is circular in cross section, while the real thing is flattened on top and bottom. To my eyes this is the biggest flaw in the kit and fixing it will make a big improvement. The M109 and M109A1 were equipped with an inflatable flotation barrier kit which was deleted from subsequent versions. The system included a boomerang-shaped cover in front of the turret, and six lugs on the bow of the hull. 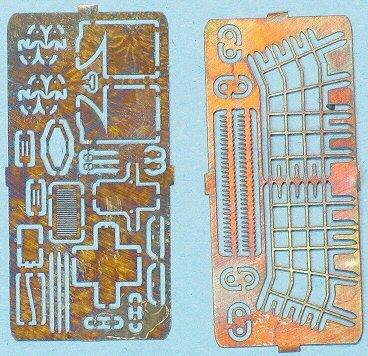 The kit includes some indication of the boomerang-shaped cover, however it is misshaped and does not extend to the hull sides. The bow lugs are missing from the kit. Also missing is the external fire extinguisher handle. The rear stabilizing spades are nicely moulded in resin and can be installed stowed or in use. Two frets of photo-etched parts are provided. 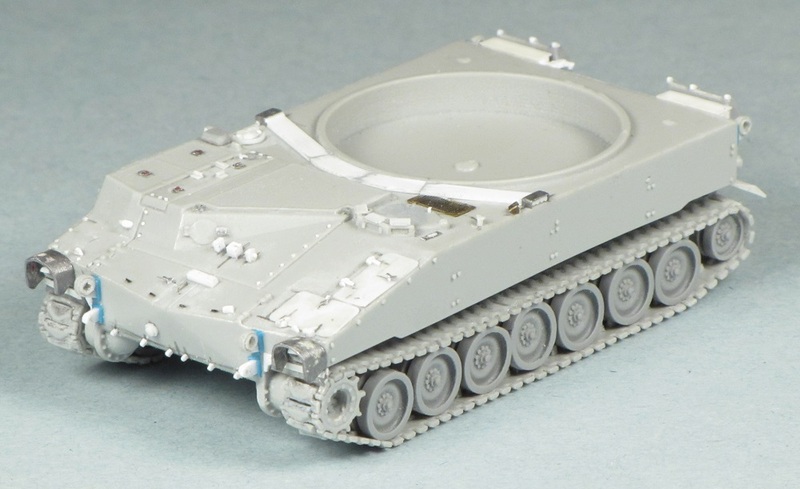 The thicker of the two (approximately 0.3 mm) provides the stowage baskets for the turret rear, the turret lifting lugs, and two lengths of 50-cal ammunition. The thinner one (approximately 0.1 mm) provides the rear fenders and their mounts, details for the fuel cans and their mounts, headlight guards, mounting lugs for the stabilizing spades, and one of the grills for the hull. I suspect the headlight guards may be a little undersized, and bending them to the correct curve may prove a challenge. Based on the measurements in Hunnicutt, the hull scales out to within 0.2 mm of 72 scale in width. The road wheels and idler are about 0.3 mm too small in diameter. The track links are about 0.5 mm too wide, and track pitch is dead on. I can only estimate the assembled hull length, but it looks to be within 1-2 mm. Overall, I would say scale accuracy is excellent. 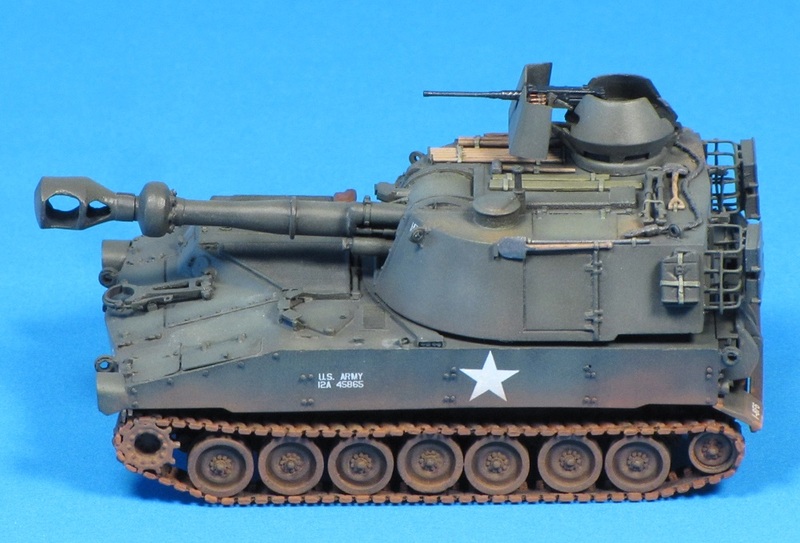 The M109 had 14 paired road wheels, and my kit only provided 12 pairs. I was able to obtain replacement parts after contacting Georgi at OKB Grigorov. The road wheels are cleanly moulded, and correctly depict the undercut wheel rims. There is no clearly defined transition between the rubber on the road wheels and the wheels themselves - this is also correct. A couple of the wheels suffered from pinholes where they were attached to the moulding blocks, but these were easily fixed with scrap plastic and gap-filling superglue. The resin was easy to work with - almost rubbery, and a lot less brittle than what I've encountered in the past. When I tried assembling an inner and outer road wheel, the gap between the wheels looked excessive. 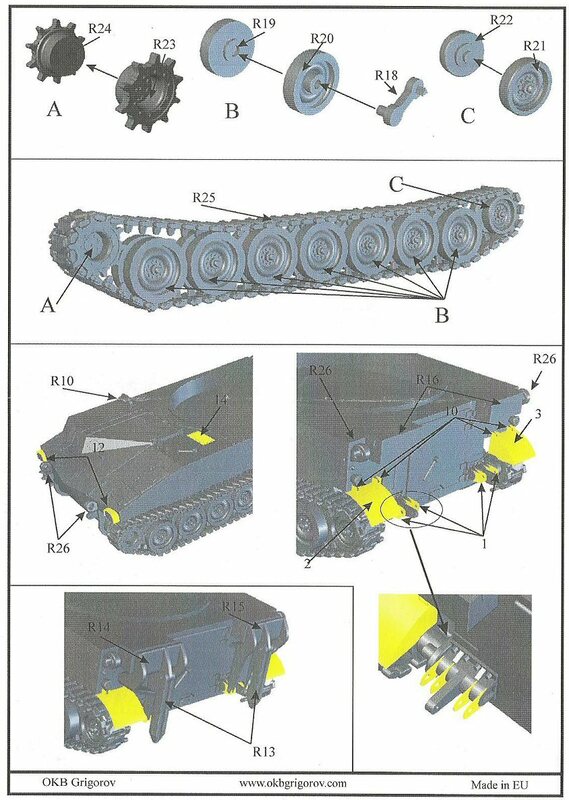 When I put the assembled road wheel against the track, the rubber sections were overlapping the end connectors, so I reduced the gap between the wheels. This was easy enough to accomplish by removing the raised boss from the outer wheel, and drilling the hole in the outer wheel a little deeper. Be careful when drilling - it's easy to pop the hub cap right off the wheel! I used the same process on the idlers to reduce the gap. I had to drill out the holes in the back of the idlers to fit the axles moulded to the hull. Similarly, I had to drill out the holes in the inner sprockets. I was impressed with the quality of the resin when removing the sprockets from their moulding blocks - it was easy to clean up the parts, with no lost teeth! The kit does not provide any tool to help align the inner and outer sprocket halves. The kit provides separate road wheel arms, which are a nice detail, but they may be a little flimsy to bear the weight of the model. Each arm has a triangular pin to fit into a keyed hole in the hull and ensure the correct alignment. Unfortunately the holes in the hull are too small to accept the pins! I drilled out the holes in the hull, and rested the hull bottom on a spacer to ensure the correct alignment of all the arms. When I installed the road wheels I found a couple were slightly off in position, but the weight of the solid resin hull helped get them close to the right alignment. The tracks are provided as several lengths of straight track, to be bent to shape. The detail of the track links is a bit soft, and the track teeth show obvious striations as an artifact of the 3-D printing process used to create the masters. 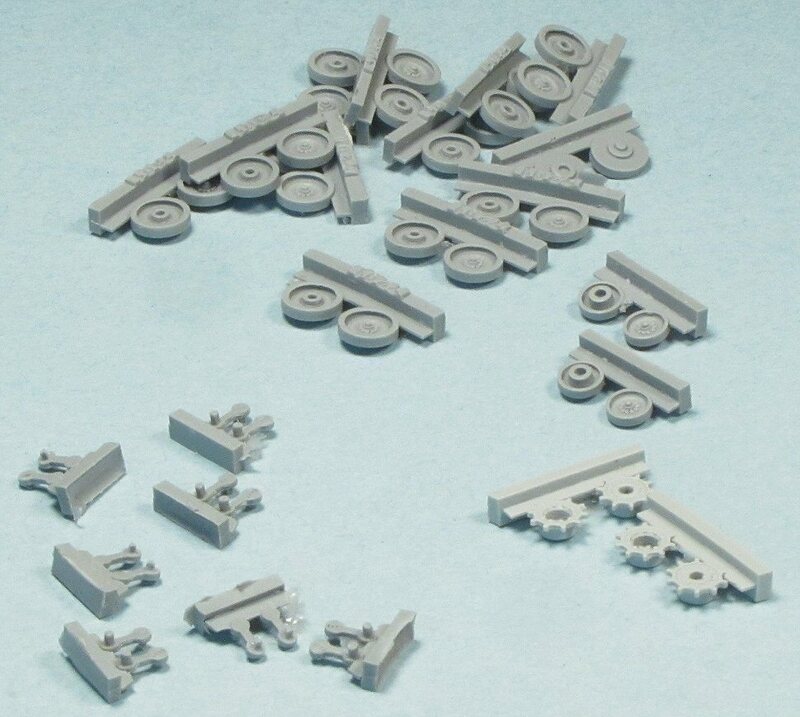 The instruction sheet includes templates of the suspension to help bend the resin tracks to shape, but I ended up just cutting up some of the lengths into individual links and assembling the track as a link and length assembly. There are plenty of spares provided. B. Missing fire extinguisher pull handle and cover. C. A strange bulge in the driver's hatch - this was caused by a large air bubble just below the surface of the part. D. The handles on the various access hatches are very crudely represented, and probably should all be replaced. 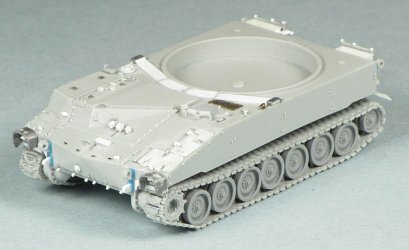 E. The two hatches at the front of the hull should be approximately equal width. The lower red line shows where the circled panel line should be. F. Four lifting handles missing at the approximate locations marked with Xs. H. Soft detail on the armoured fuel cap, and the guard is incorrectly shaped. 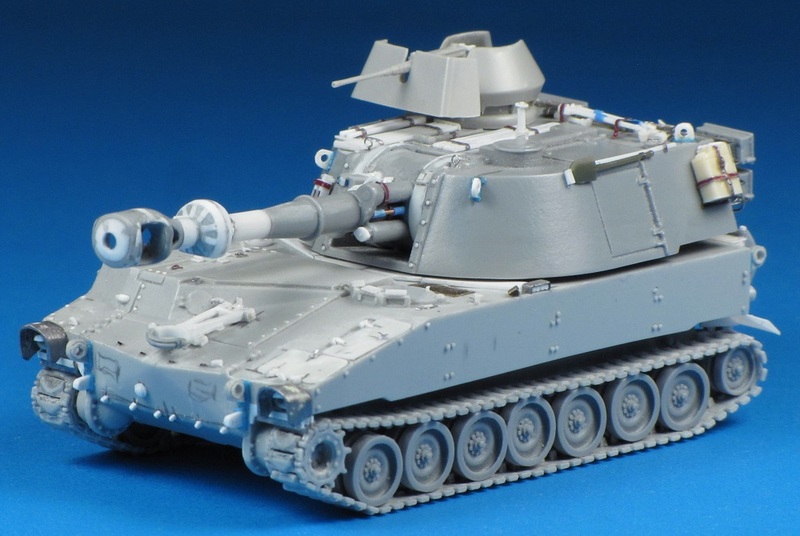 This list is not comprehensive - other issues include poorly represented bolt detail (strangely the bolt detail on the sides of the hull is nice and crisp) and missing periscope covers. 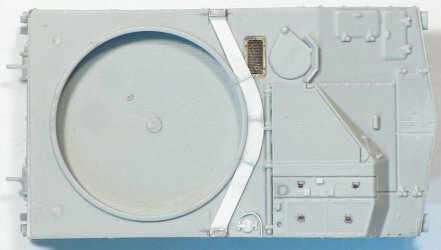 Some of the angles and shapes of the engine deck and front hull are not correct, but I chose not to try rebuilding the hull. I. The stowage bins provided are too deep and too tall - they should not protrude further than the lifting lugs. J. These recessed rectangles should actually be slightly raised. This area will be hidden if the spades are in the raised position. K. The door handle is moulded in the incorrect position for a locked and shut door. Also the handle has the wrong contours. L. There should be a small cable reel in this location. 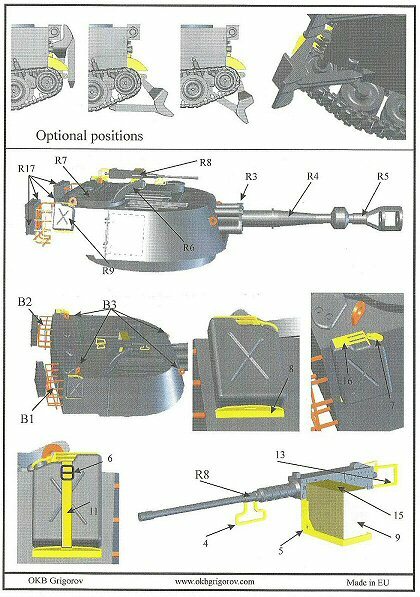 M. The mounting plate for the towing pintle is provided, but not the pintle itself, which could be mounted here or stowed on the rear door when not in use. N. There should be a latch here to hold the door in the open position. 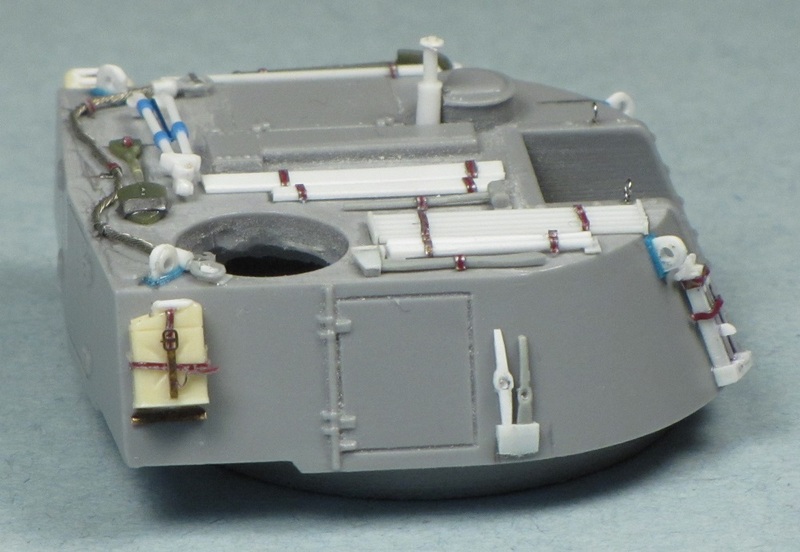 I replaced the stowage bins and the hull door handle, added the cable reel, the latch the holds the door open (subsequently replacing this again to match the corresponding parts on the turret), and added a towing pintle modified from a Dragon Sherman part. I slightly lengthened the tips of the ribs on the spades as they should extend beyond the blade itself. I'd planned to use the photo-etched rear fenders provided in the kit, but they are curved. 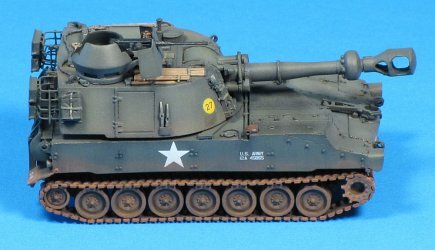 As far as I can tell, curved fenders only appeared on very early production M108/M109s, and most had angled rear fenders. I made these from thin plastic sheet. I tried to use the microscopic photo-etched fender brackets, but they were too hard to work with, and probably actually too thin, so I just added scraps of plastic to represent the brackets. At the front end I did lots of little upgrades - the six small lugs on the bow for the flotation system, the fire extinguisher pull handle, the periscope covers, handles for the engine deck covers, and front mudguards. 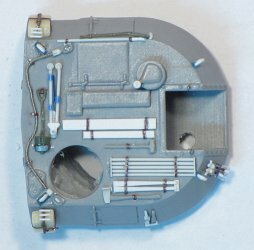 In replacing and enhancing the detail it became apparent that the incorrect proportions of the kit engine deck would make it difficult to get everything right without a total rebuild of the engine deck, so I did what I could to improve the detail, knowing that there are inaccuracies. I though the bolt detail on the engine deck was too soft. The real bolts are actually countersunk, so I drilled tiny holes and inserted even tinier bits of plastic rod into them, and sanded them down until they were just slightly proud of the deck. In hindsight, maybe using hypodermic tubing to scribe tiny circles might have been a better solution. Thin kit provides very thin photo-etched headlight guards, which I thought didn't capture the hefty appearance of the real things. I had a go a thermoforming some without much luck, and ended up making them from two laminated layers of wine bottle foil, formed over a basswood shape. Making two as mirror images of each other was a challenge. 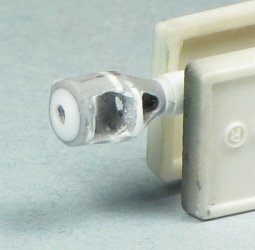 The barrel travel lock is provided in two parts in the OKB kit, but the parts lack detail of the locking mechanism and the main support is the wrong shape. I scratchbuilt the lower section, and slightly modified the kit part for the top section of the clamp. The travel lock this was one of the few parts in the kit that suffered from air bubbles - there were two on the inside of the clamp, both easily filled with some plastic rod and super glue. Q. The circular item is the cover for the panoramic sight (moulded in the closed position). It should have a vertical shaft on which it extended when open. 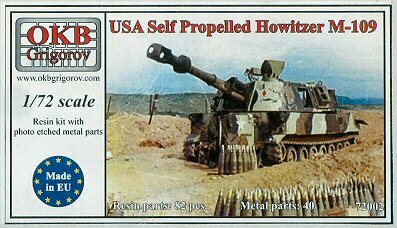 R. The giant bolt cutters should be a folded M3 tripod for the 50-cal machine gun. 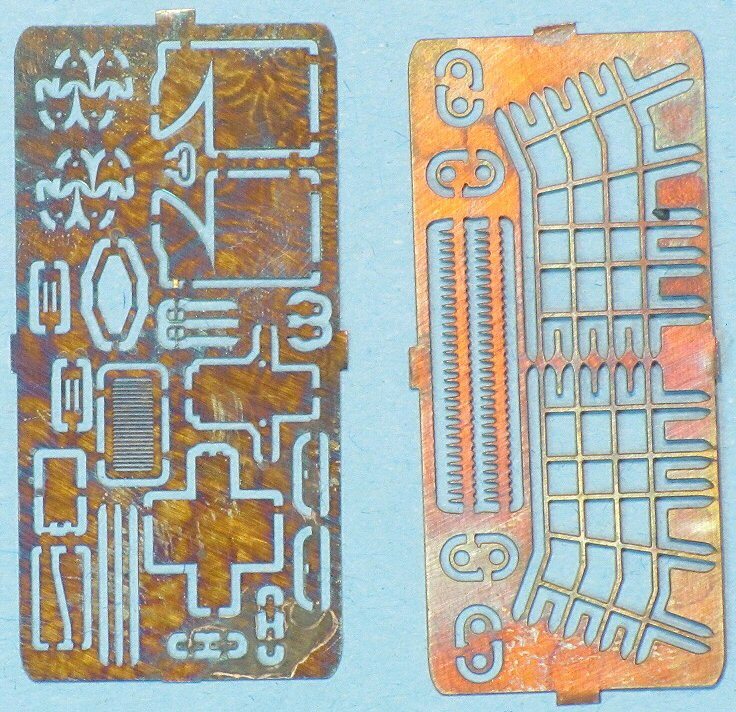 T. These nondescript rectangles represent stowed aiming posts (top) and spare 50-cal barrels (bottom). I believe both sets of items were stowed in bags. In any case, like the rest of the stowage that is provided, there are no straps to secure the items. U. 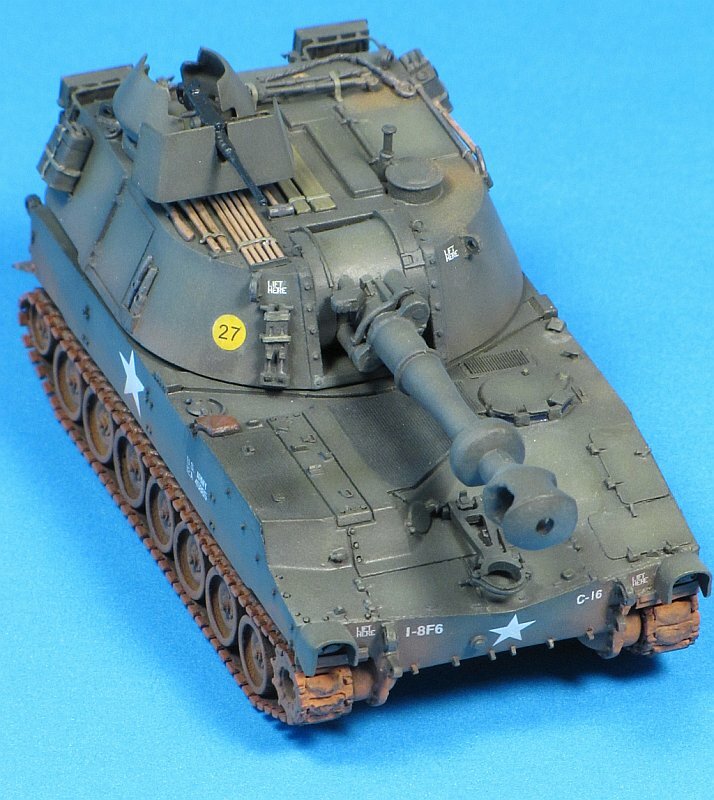 The M109 should have a 5-piece barrel cleaning rod, not 4. Later variants had 7-piece rods. V. These should be a pair of handles for the mattock and pick axe. X. The pick axe and mattock head should be stored here. Y. The track fixture should be stowed here. I started by carving off all the moulded on stowage and replacing it with spare parts (axe, sledge hammer, mattock head from a Dragon Sherman; spade from an S Models M151, shovel from an S Model Renault UE), or scratchbuilt parts (mattock and pick axe handle, pick axe head, barrel cleaning rods, crow bar, tow rope, track fixture, tripod). I used lead foil to add the missing tie down straps. I also replaced the stowed aiming stakes and 50-cal barrels to make them look a little more like bagged items. 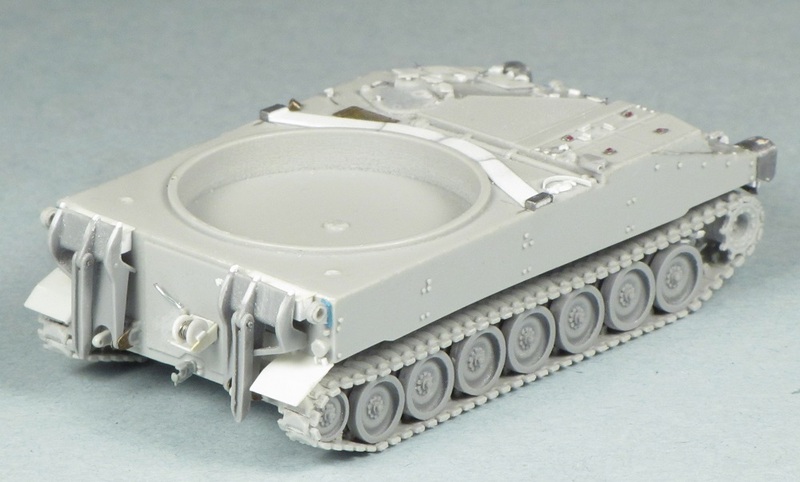 The kit provides the turret lifting eyes as thick photo-etched parts. 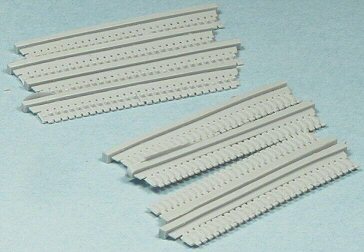 I replaced them with plastic sheet, and added lengths of stretched triangular sprue to replicate the prominent weld beads. I felt the jerry cans provided in the kit were too skinny, so I replaced them with Armand Bayardi items with new handles. 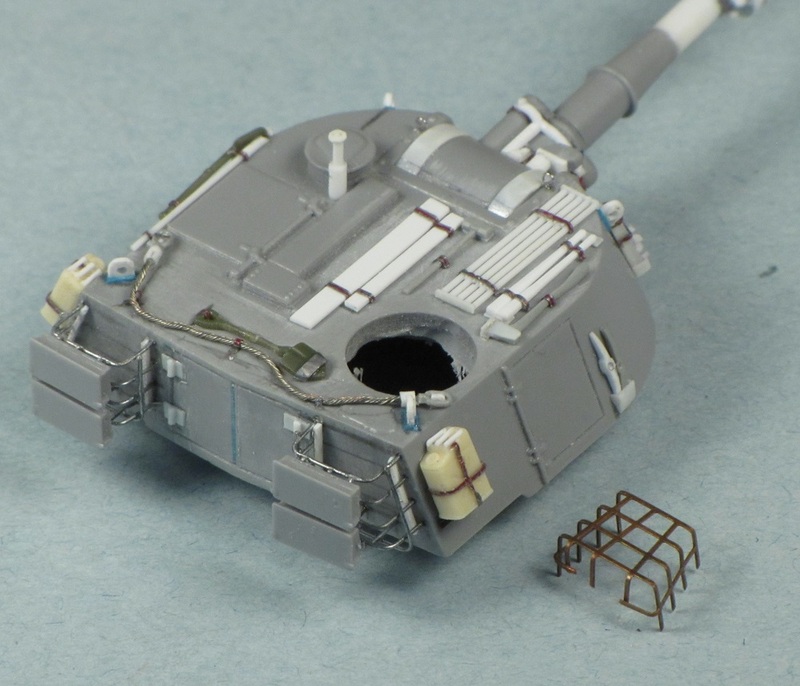 The stowage racks at the rear of the turret are provided as thick photo-etched parts. I folded one of the baskets to shape, and it looked OK, but it didn't really capture the 3D quality of the real bins, and the bottom of the basket is not complete. I rebuilt the baskets with wire. Consistently bending the wire to the right shape and curve proved to be a challenge, so I created a jig, consisting of a plastic former to bend the wire around, with holes drilled to position the wires. After a moderately successful test run with a homemade jig, I decided the best approach was to drill holes into the cab (turret), then bend the horizontal bars to shape. When these were installed, I added the fore-and-aft uprights, using superglue to attach the wires, and finally added the u-shaped side-to-side bars. It took a bit of trial and error, but I think the end result looks good. However, after the resin stowage bins are attached to the baskets, a lot of this work is hidden, so maybe I should have stuck with the kit parts! 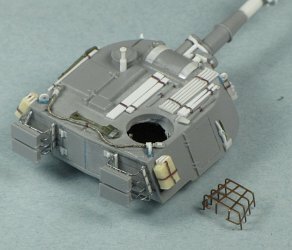 The last little job was scratchbuilding the three hold open latches for the two doors on the turret rear and the door on the hull rear. 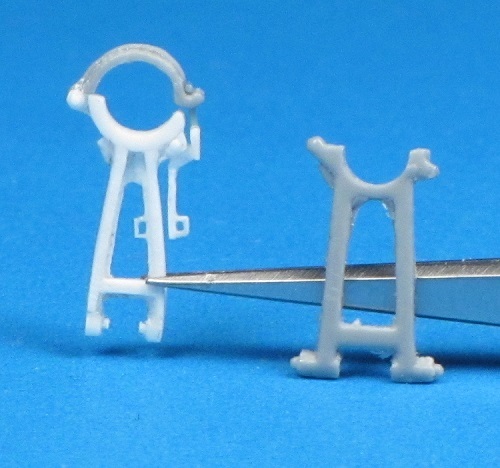 These are pretty tiny, but each is made of 10 separate parts. They don't photograph well... To add a little interest, I decided to depict an M109 with the standard commander's cupola replaced with an M113 commander's cupola, complete with ACAV gun shield. 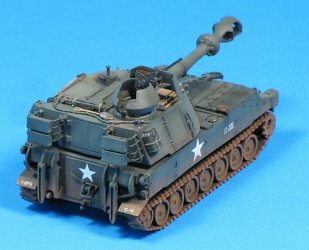 I robbed this assembly from a Trumpeter M113 kit. I thinned the shield a little and added the gussets on the inside on either side of the gun slot. I used the Trumpeter 50-cal, with scratchbuilt spade grips. 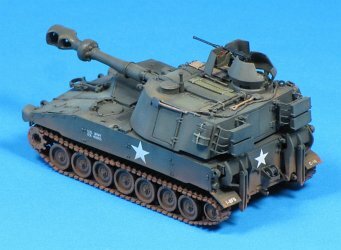 I used the ammo box and a strip of 50-cal ammo from the OKB kit. Z. The kit muzzle brake is circular in cross section, but should be more oval. The end face is flat but should be convex. The rear section is too narrow. AA. The bore evacuator is too small and missing the prominent bolt detail on the rear face. AB. The thinnest section of the barrel looks too thin. AC. 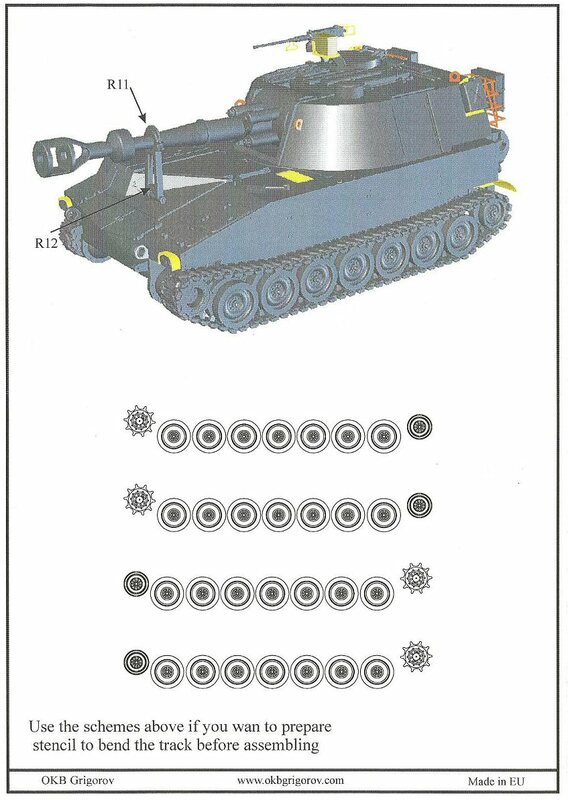 The kit has two recuperators (lower left and upper right of the barrel) and two recoil cylinders (lower right and upper left). 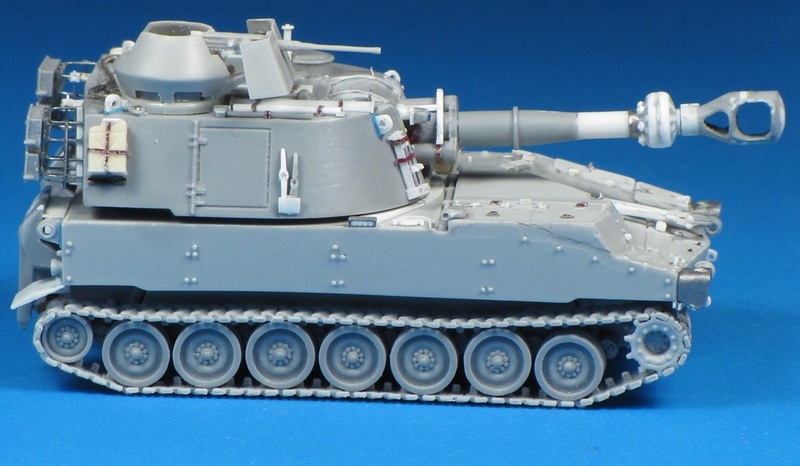 The real M109 has only one recuperator (lower left) and an offset telescopic sight to the upper right. The kit provides the offset sight head, but no instruction on where or how to mount it. AD. 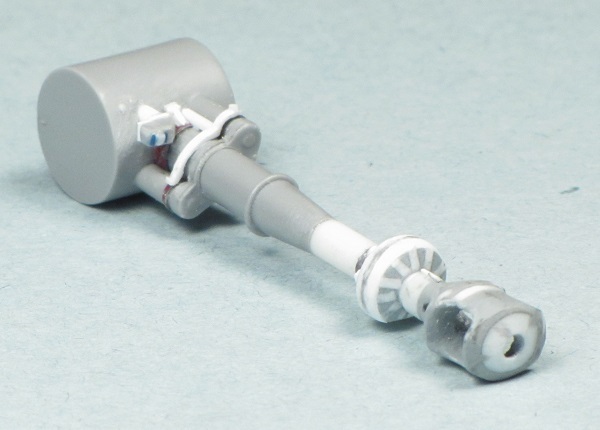 The kit is missing a linkage between the recoil cylinder and recuperator, as well as details of the variable recoil mechanism on the opposite side. The biggest job was reshaping the muzzle brake. I added crescent shaped scraps of plastic to either side of the kit muzzle brake, and a roughly oval shaped plate on the front, and then refined the shape with lots of sanding and file work. 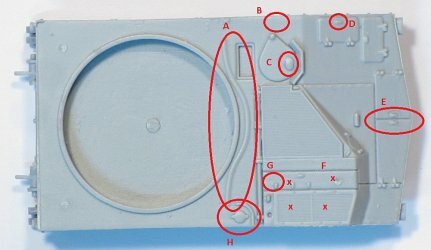 I rebuilt the bore evacuator from discs of plastic card, and created the tapered sections from triangular scraps and putty. The section of the barrel aft of the evacuator was replaced with Evergreen tube. While studying photos I noticed another issue with the gun. Note the two white bands at the edges of the mantlet. 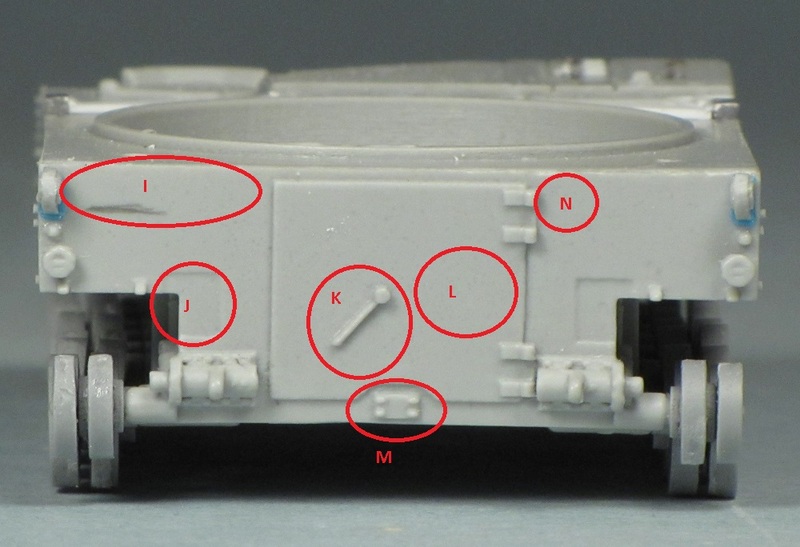 These are missing from the OKB kit, and are actually a fixed part of the cab (turret), while the cylindrical rotor shield moves with the gun. There should be a thin raised lip on the inside of each of these bands, which I added later. 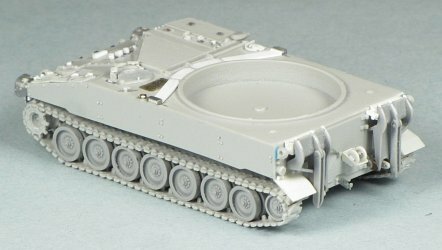 As designed, the kit gun sits too far forward in the turret, so I removed the rear section of the cylinder moulded at the rear of the barrel and also used my Dremel to remove more material inside the turret until I was happy with the placement of the gun in the turret. The barrel was then firmly glued in place. I decided the vague bolt details on the mantlet weren't good enough, so I replaced those with punched disks. Aligning individual bolt heads is much harder when supergluing to resin! I gave the model a coat of flat black as a primer. I found some issues with irregular surfaces on the front right side of the hull and the front left top side that required filler and sanding. I played around a lot to get a colour I was happy with - it's based on Testors Model Master Olive Drab darkened with flat black over a black primer coat, with many thin coats applied. The final colour is probably a bit too light and chalky, but we'll call it scale effect. 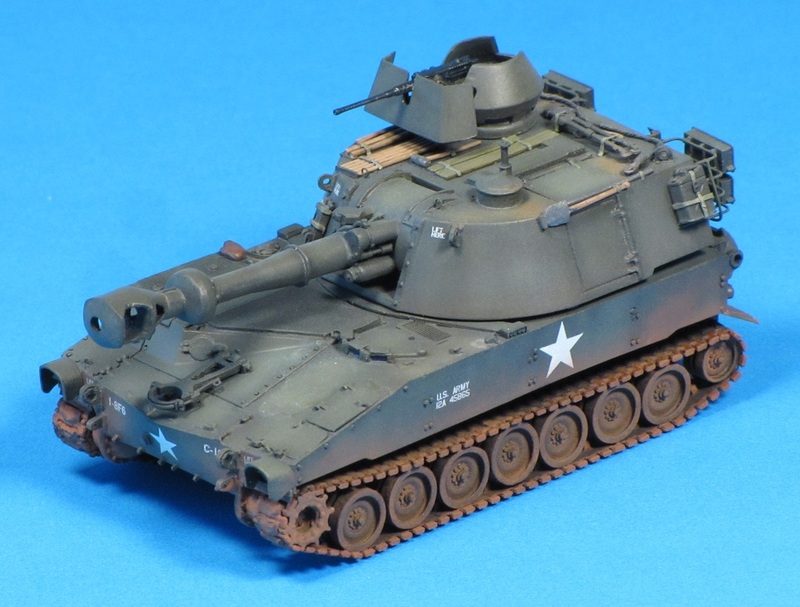 The markings are inspired by the 1/35 Tamiya issue of the Italeri kit which includes a vehicle with the ACAV cupola. The white serial numbers, unit codes and LIFT HERE markings were ALPS printed by a friend. The stars are from 4 different kit decal sheets. I searched through the whole decal stash to find an appropriate size of bridge classification sign, but couldn't find anything close. I ended up spraying white and yellow onto clear decal film through a circle template, and then layering the decals to give a solid colour circle. I kept the weathering pretty mild. I experimented with airbrushing Mig pigments to give a relatively light coating of dust, chiefly on the lower hull. I used Testors universal acrylic thinner as a carrier medium. 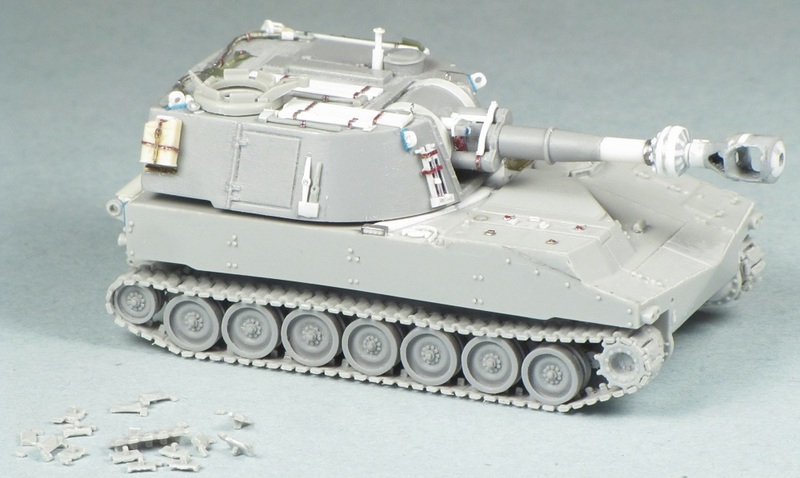 The OKB kit is OK. It is let down by soft detail in some areas, a very poor representation of the 155 mm gun, and some shape issues with the front hull. I addressed most of the detail issues, but didn't try to fix the hull shape. This was one of OKB's first full resin kits, and newer kits show a lot of improvement. Since I started building the kit, both Riich (M109A2 and A6) and Revell (M109G) have issued kits. 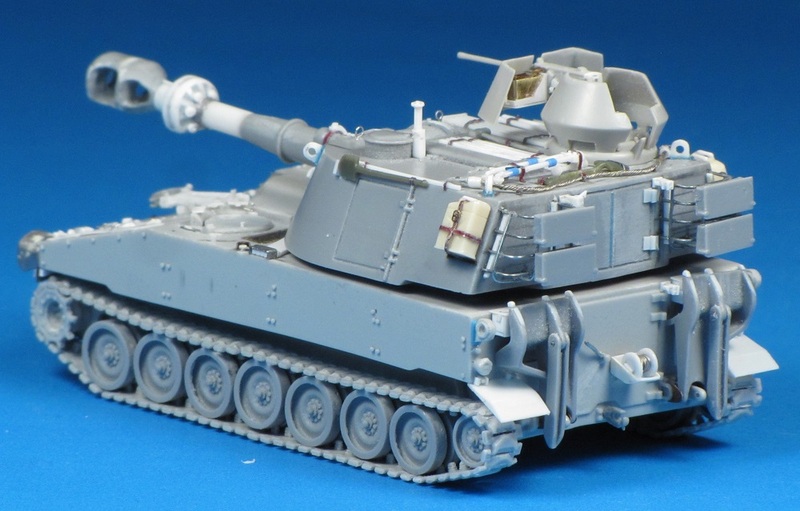 For someone looking to build a Vietnam-era M109 using injection moulded kits, these could be kitbashed, combining the Revell suspension, hull, turret and gun minus the muzzle brake with the tracks and muzzle brake of the Riich kit. 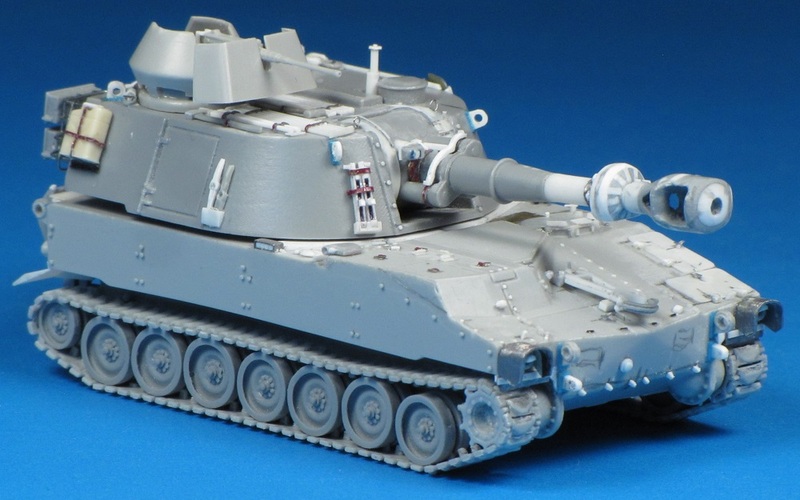 The cost of this would likely approach that of the OKB kit. 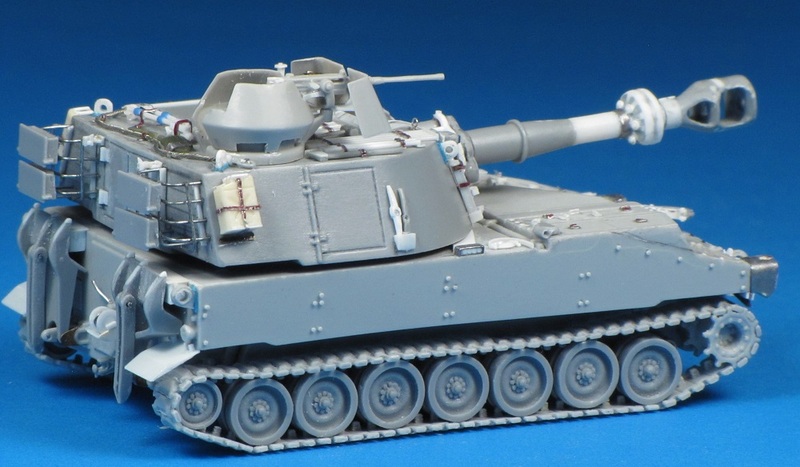 OKB Grigorov has also recently released M109 tracks as a separate item. 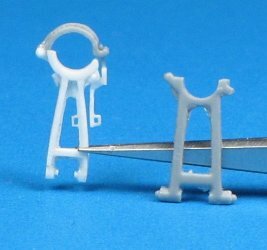 I'm not sure if these are identical to the parts provided in this kit.